MEMORIES do not always marry with the moments they capture. When it comes to Mark Walters and his Rangers debut in the Old Firm derby exactly 20 years ago this Wednesday, that may be deliberate. "It was a good day for me; a special one," recalls Walters, who signed for the Ibrox club from Aston Villa in a £1.3m deal on New Year's Eve 1987. "It was a great experience to play my first game for one of the biggest clubs in the world in front of 50,000 at Parkhead – the largest crowd I'd known since earning a schoolboy cap for England. I have shut out anything other than the positives of that day, because it was so exciting to make a fresh start at 23, after two years when my career was on the slide." On January 2, 1988 Walters became the first black player to turn out for Rangers. The abuse he was subjected to that day, and at Tynecastle two weeks later, ended any foolish notion that, while Scottish football was blighted by religious bigotry, it was at least immune to the vile expressions of racial intolerance then infecting the English game. Whenever Walters' name is mentioned in this county these two afternoons are seared in the mind. They have come to define the winger's three-and-a-half years north of the Border; more than his artistry, more than a stash of medals or a goals to games average of one-in-three during his 100 matches. "People ask me how on earth I could get through that first game and enjoy it," says the player, who made little impression that day as Rangers were beaten 2-0. "To be honest with you, being abused wasn't that much of a rarity in Britain at that time, even if it was more than I was used to. "I am single-minded. I was brought up by my family to see every experience as to be welcomed because you can always learn from it what you need to be better for it." Scottish football did not demonstrate such insight – either in terms of the authorities or the media. Clips on YouTube make plain the grim extent of the monkey noises and banana throwing Walters' presence at Celtic Park prompted. Yet, though Celtic slammed the perpetrators, the Scottish Football Association remained silent. And oddly, in the press over the days that followed, there was scant acknowledgement of a virulent new strain of racism at football in this country. It was just viewed as another manifestation of the contrariness that Old Firm hatred spews forth. "Only a handful of fans hurled fruit," said a comment piece in the Sunday Mail. The match reports in The Scotsman and the Glasgow Herald made no reference to the treatment received by Walters. Indeed, the most vociferous condemnation of those who indulged in racist behaviour came in the form of letters printed in Celtic's own newspaper that week. It wasn't simply in the written press that the issue was skirted around. Archie Macpherson, in his commentary for the BBC, was forced to explain a stoppage to clear bananas from the Celtic Park pitch. He did so by stating, matter-of-factly: "The game has been slightly held up… some assortment of fruit has been removed… you can see it in front of the Jungle." Two weeks later, Rangers faced Hearts at Tynecastle and Walters was struck by a banana and was met with what the Glasgow Herald described as "deluge of fruit" (contrasting with the "mild outburst of fruit throwing" a fortnight earlier). On television that evening Macpherson famously held up a banana and stated what he had witnessed "made him ashamed to be Scottish". Macpherson puts down the difference in tone to the obsession with picking away at the sectarianism woven into the fabric of the Old Firm rivalry. Throughout his long career, at least he is one of the few who can claim to have an admirable record on denuding those who would clothe themselves in such tawdry dress. "There is a conditioning process with these derbies," he says. "We would listen out for sectarian chanting, scan for any disturbances in the crowd and consider the possible implications for public order if there were any violent incidents on the field. Racial taunting didn't enter my head as a contentious issue. I had been brainwashed by the religious divisions. I do not say this as an excuse for failing to acknowledge the infamous nature of banana-throwing but merely as explanation. "On reflection, I should have been more vocal about it, as I have always been vocal about the other evil aspects that have attached themselves to this fixture. I, wrongly, saw the banana-throwing as in essence puerile; an insipid form of the Celtic support's capacity for a wind-up, at which they are the best in the business. If more had been made of Walters' treatment at Celtic Park, he might not have had to put up with so much at Tynecastle." It is the very collision of sectarianism and racism that probably left the SFA and the media in a quandary over how to react to the abuse suffered by Walters. The governing body could hardly punish a club for their fans' racist actions when they had never dared bring followers of any side to book for any bigoted behaviour. Equally, how could the issue be highlighted in print without similar weight being given to the fact that, then, Rangers were still 18 months away from a first high-profile Catholic signing in the modern era? To this day, predictably, there remain pathetic attempts to point-score among the followers of the Glasgow clubs over how much baiting Walters received. Gerry Britton was on the ground staff at Celtic back in 1988. Now manager of Stranraer and a leading figure in the Scottish Professional Football Association – work that involves schools' education programmes on sectarianism and racism – his testimony cannot be disputed. "It was one of the very few days I fell out with fans of the club I grew up loving," Britton says. "It was bad enough having to hear it, and hearing that a fruit shop near the ground sold out of bananas, but it was truly sickening when our job the day after the game was to clear them away. There were dozens of them, scattered everywhere." The mood in the country changed following Walters' treatment at Tynecastle, which came after he had made incident-free appearances against Dundee and Morton. SFA president David Will said all would be done to stamp out racism with the hope that "sensible supporters will let the minority know they shouldn't be so stupid in the future". Hearts chairman Wallace Mercer condemned the banana-throwing as "intolerable social behaviour" and that his club "must be seen to take a stand against racism". Rangers also spoke out, operations executive Alistair Hood demanding the SFA act to "cease" "this kind of despicable behaviour". "Mark Walters was struck by a banana and no matter how you look at it, this is missile throwing," Hood said. In forcing Scotland to confront latent racial prejudices 20 years ago, Walters made life at least a little easier for the black players who followed him within these borders. Yet, the treatment meted out to Celtic's Paul Elliott only 18 months later, and the fact that since the turn of this century racist abuse directed towards Hamilton's Brian McPhee, Celtic pair Bobo Balde and Momo Sylla and Rangers' Marvin Andrews has resulted in court cases, suggests as a nation we are not as mature as we would like to believe. As does what happened to Paul Omoniyi, taunted with monkey chants while playing for West Park United under-11s in Dunoon in October 2005 – a case highlighted by this newspaper. "I am not so shallow as to believe I made a real difference," Walters says. "If it hadn't been me it would have been someone else. If I made one person realise it is wrong to abuse a person because of the colour of their skin, that is something. But football reflects society. Prejudice is based on ignorance and many of those guilty of it have probably become educated because we live in a more ethnically diverse country. As well as that, there are laws now in place and CCTV cameras at all grounds. That means supporters just can't get away with the same abuse and behave at games as they might have done years ago. People might still say and do things in private, but in public..."
It is depressing to think that enforcement as much as enlightenment might account for Walters being the only black footballer in this country to have had bananas thrown at them. Mark Walters joined Rangers from Aston Villa for £1.3m on December 31 1987 to become the first black player to play for the club. He was signed by Ibrox manager Graeme Souness. He made his debut against Celtic at Celtic Park two days later, a match Rangers lost 2-0. During the game Walters was subjected to monkey chanting and some Celtic fans threw bananas on the pitch. 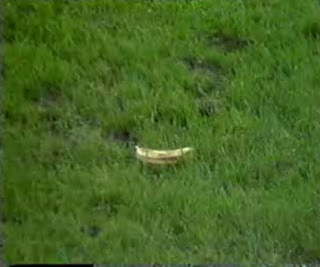 Gerry Britton, then on the groundstaff at Celtic, was one of the apprentices charged with clearing the bananas from the pitch the following day. "It was truly sickening," he recalls. "There were dozens of them, scattered everywhere."